Despite the recent blustering conditions Tony Damevski headed out with a few mates into Port Philip bay and had great success with the Snapper. Tony bagged out after only 2 hours catching many Snapper up to 6 kilo. The most productive bait during the session was a full or half pilchard on a snelled rig. 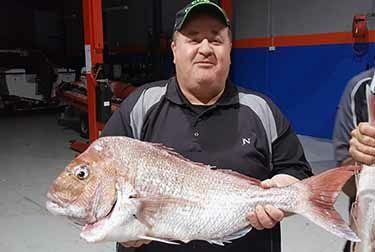 Tony had his rod broken by one of these big reds but that didn’t damper Tony’s spirit as he was absolutely thrilled to catch his first Snapper of the season. Well done Tony.